Please post all your comments, questions and info regarding the Rolling Stones No Filter Tour 2017 in Stockholm Sweden here. Edited 2 time(s). Last edit at 2017-08-28 11:16 by bv. Let us get a special printed AIK/Stones T-shirt for this historical event!!! Is the stadium as easy to reach by tube like the Tele 2 Arena ? If I checked correctly, it's even easy to reach by foot from the airport (about 5km). Friends Arena can best be reached from downtown Stockholm by a local train. There's also a couple of tube stations but almost a mile away. Edited 1 time(s). Last edit at 2017-05-10 22:40 by Topi. What's the meaning of "Främre Ståplats" = Premium standing? and "Läktare 1 Främre" = seats? 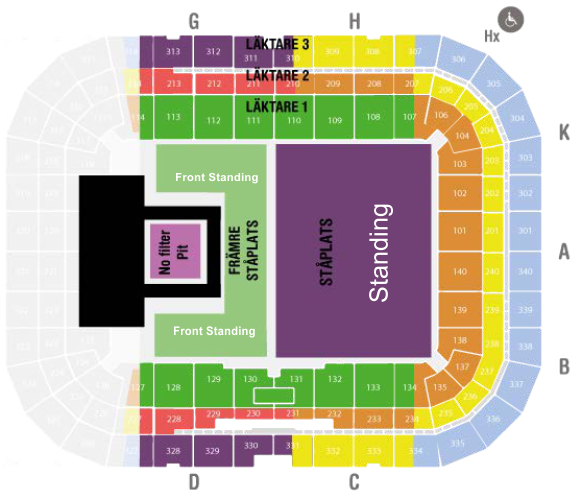 Främre Ståplats should mean Front of floor standing = Golden Circle. It's a roofed football stadium so seats are quite far away. PIT's available GOLD for 216 euros. Edited 2 time(s). Last edit at 2017-05-11 10:07 by gotdablouse. No filter = pit (2095 SEK)? Edited 2 time(s). Last edit at 2017-05-11 10:26 by MAF. Edited 1 time(s). Last edit at 2017-05-11 10:20 by Topi. I'm in the pit! Woohoo! In the same city Mick Jagger signed for me last time! Yep, they're still coming up and "only" 273€, lucky people of Stockholm vs Paris ! Edited 1 time(s). Last edit at 2017-05-11 10:25 by MAF. I have the pit!!! I have tehe pit!!! I have the pit!!! And I am going to Stockholm!!! I don't know what makes me more happy - I spent an amazing year as an exchange student there 18 years ago and I haven't been there for 14 years, I can't wait really!!! What's written on your ticket? my swedish is not that good but it's no pit ticket! Got 4 tickets in Front Standing. Happy!! 2095 SEKs each. Giving up until the public sale. Swear filter p1? ?ed off. I've tried for Paris, Luccs and Stockholm, getting nothing of interest. Standing tickets still available at ticketmaster.se. Does anyone know what Platinum is? Nice and easy this morning getting a couple of 'Front Standing' tickets. Couldn't find any pit tickets but I'm happy with the front standing area. Looking forward to my first visit to Sweden! Platinum is just TM scalping their own tickets. Long-standing practice in the US now "also available in Europe!" DON'T DO IT. Got my tickets for the Front Standing! Had to buy one at the time! Is there a ramp surrounding the No Filter Pit, for the band to move around (like the tongue Stage from the Super Bowl)? Now I need a map with the gates of the stadium. BTW: What's the weather like in mid October in Stockholm?